Blurb: Scotland’s biggest claim to footballing fame undoubtedly rests at the feet of none other than Sir Alex Ferguson. While there is no point in running through the dossier of the greatest manager in British football history (some say he can stake a claim for Europe as well), it’s rather mind boggling why a nation which produced such a brilliant managerial mind has failed to measure up on the international stage. Despite possessing one of the greatest club rivalries on the continent, while producing brilliant individual players in the past such as Jim Baxter, Dave Mackay, Jimmy Johnstone, Denis Law, John Greig, and Kenny Dalglish, Scotland remains a heart-breaker. Of the eight World Cup’s and two European Championships they have featured in, even those featuring the big names above, Scotland has never made it out of the group stage. Even more depressing is their mark of only four wins in twenty-three World Cup fixtures. The questioning constantly surrounding Scottish football is when will their credible past and their ability to once upon a time produce top players propel them to a level above where they currently reside. Sometimes all it takes is one player (Gareth Bale for Wales, anyone?) to ignite the propellant charge, and it is with that in mind that we look at none other than RasenBallsport Leipzig youngster Oliver Burke. 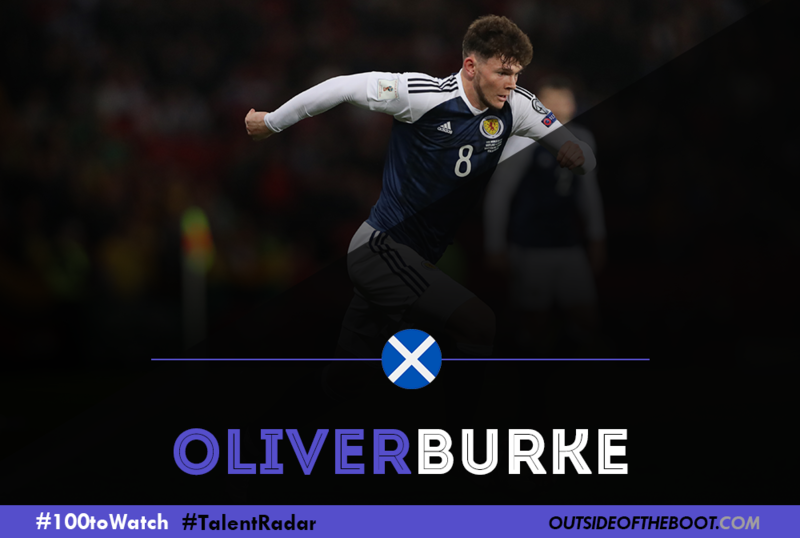 Analysis: When it comes to Kirkcaldy-native Oliver Burke, the question isn’t how he will break out, it’s when will he. His performances for Nottingham Forest at the back-end of the 2015-16 Championship campaign as well as the beginning of the 2016-17 edition are the reason he made a shock move to ambitious German upstarts RB Leipzig. With a vision of the future that puts faith in youth ability, Burke was seen by director of football Ralf Rangnick as a positive addition to Leipzig’s youth movement. Burke started the 2016-17 season like a house on fire with Forest to the tune of four goals and one assist (in the first five matches of the season), Leipzig swooped in and paid handsomely for it. For Burke, the move was an obvious one – a higher level of football in a country who is at the forefront of youth development – what happens now, however, will fall on his young but gifted shoulders. After coming through the Forest youth ranks from the age of nine having spent his first year at Mowbray Rangers, Burke broke into the first-team of the City Ground-side at the age of eighteen. Though he only registered two goals and two assists for Forest by the end of the campaign, his progression as a player was certainly evident. Capable of playing on either flank (though being best deployed down the right-hand channel), Burke relies on his technical ability on the ball, pace, and knack for taking players on; in this sense, he is very much a proto-typical winger. What can potentially set him apart is not only his eye for a pass and special awareness both for himself as well as those around him, but also his ability from dead-ball situations. His profile from a technical standpoint certainly fits Leipzig’s tactical schematic. With Die Roten Bullen capable of both hanging on to possession and building up play, but more expertly playing quick and incisive direct football on the counter, Burke has found himself in the right system seemingly at the right time; the perfect storm of progression where both club and player can benefit. Like almost all young players, Burke is by no means a finished article, and the Scottish international certainly has his drawbacks. Despite his ability on the ball, he certainly can be accused of being wasteful when in possession of it. In that same light, though his ability to pick a pass has been lauded, he can be equally accused of making quite a few ill-advised choices when surveying his passing options. Thankfully, these are traits that, with time, can and should be rectified – baring he continues to see time on the pitch. Looking Ahead: Time is everything for Oliver Burke, and right now, time is not something he is getting an exorbitant amount of in Leipzig. Naturally there is always an adjustment period for players, and considering Burke came from the Championship and is now residing in one of the best leagues in Europe, his period could certainly take a while. Despite that, he’s still only made just the one start for RBL, while appearing as a substitute on twelve occasions, at the time of writing. While he may be seeing minutes overall, those minutes must substantially increase if he hopes to break into Ralph Hasenhuttl’s XI on a more frequent basis; there-in lies the problem. Because RBL are so adamant about building for the future through youth, all the competition for places (and time) that Burke must contend with are all fellow youngsters looking to develop the same as he is. Leipzig’s options in attack consist of Burke himself, German youth international’s Davie Selke and Timo Werner, young Austrian international Marcel Sabitzer, young Danish international Yussuf Poulsen, and Swedish talisman Emil Forsberg. It’s difficult to say where Burke could be in a year, two years, or five years from now. The possibilities fluctuate between stardom in Leipzig or a return to Britain in a kick-start campaign. Regardless of where he may end up down the line, one would be shocked if it didn’t include him being a key asset to whatever club he cements himself to. Blurb: Though one of a few fledgling nations in Europe, Kosovo is one of the feel good stories in recent memory. Once given full recognition by both FIFA and UEFA, a full squad was assembled, containing many odd-commodities and lesser known players. For a young team, with an average age of just 24.2 years old, it will always be rough going in Euro and World Cup qualifying, but perhaps there is a bit of a future hidden away under the surface. A handful of young Kosovo internationals can claim a bit of pedigree, with Milot Rashica and Valon Berisha staring for clubs Vitesse Arnhem and Red Bull Salzburg respectively. 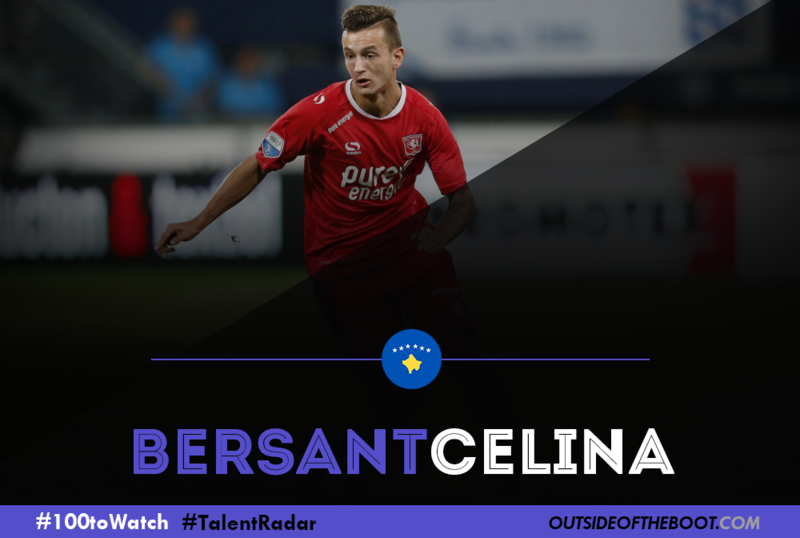 Another young player who has been carving out a name for himself is Bersant Celina. Analysis: Born in the historic and picturesque city of Prizren, Celina, like so many other children, moved away from the region, settling with his family in Drammen, Norway at just the age of two. His footballing education began in earnest in 2007 as an eleven-year-old when he joined the Stromsgodset IF academy. After spending five years with Godset, Manchester City offered him a scholarship to their development academy in 2012, before signing him on a full deal in the summer of 2014. By this time Celina was already an established Norwegian youth international, but after only making two appearances for Manchester City in the last two seasons, he was loaned out to Eredivisie-side FC Twente this past summer. Since his arrival at the De Grolsch Veste, Celina has cemented his place as the team’s number 10, and a vital piece of the attacking puzzle. With the departure of Hakim Ziyech to Dutch giants Ajax, Twente manager Rene Hake has leaned on the Kosovo international to pull most of the strings in midfield and further forward. Playing in an advanced role just behind the front three, Celina’s combined creativity and eye for goal has been crucial in their efforts in the push for European places. Excellent in possession, good on the ball, able to pick out a pass as well as have a crack at goal himself, Celina’s key passes (1.53/90min), chances created (1.68/90min) and pass completion (83%) at the time of writing are indicative of how effective he has been in the role he has been tasked with. For all his positives, his all-around game does need work. Celina certainly suffers when asked to regain possession and chip in on the defensive side of the ball, and his weakness in the air and in the tackle can be exposed all too easily. Looking Ahead: Like fellow City loanee Enes Unal, Bersant Celina is carving out a positive reputation at present, but will have questions to ask once his loan spell is complete. With Pep Guardiola having the luxuries that are David Silva, Kevin De Bruyne, and Ilkay Gundogan occupying central creative roles, and only Silva being above the age of 26, it’s difficult to see Celina come back to the Etihad and carve a place for himself in the first-team. Truly, his future may be better served elsewhere than at a spending club. Regardless of the questions soon to be asked, what is a near guarantee is that Celina will continue to be crucial for Twente in the current campaign, as well as play an increasingly bigger role for Kosovo during their difficult World Cup qualifying campaign. Blurb: There are some clubs known for producing wonderful talents and Dinamo Zagreb would be right on top of that list. 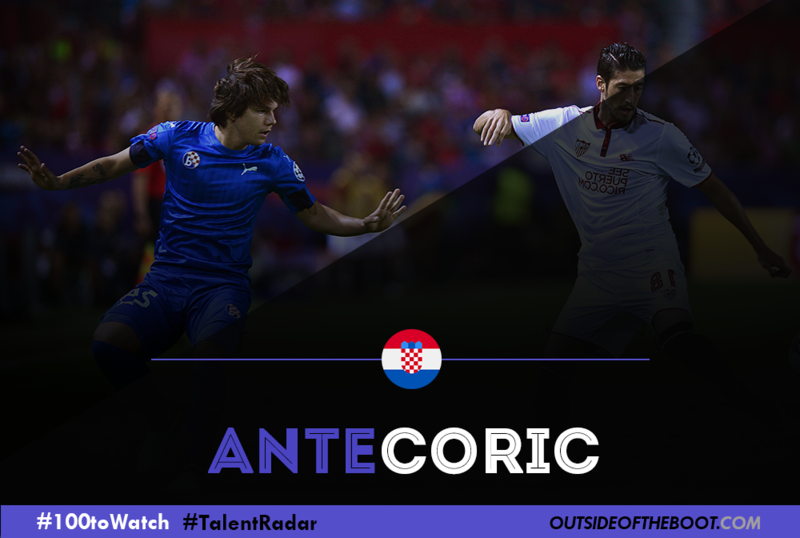 Ante Coric is arguably their most prized possession at the moment. The 19-year-old played for a couple of Croatian clubs before signing for the youth academy of Red Bull Salzburg, despite notable interest from other “big” clubs like Bayern Munich, Chelsea and Barcelona. In 2013, Coric was brought back to Croatia after Dinamo Zagreb decided to spend 900,000 euros on him. Since arriving at Zagreb, the attacking midfielder has made almost one hundred appearances for the Croatian outfit in all competition, despite being only 19 years of age. After getting promoted three times (U18, U19, U21) in a period of seven months with the Croatian national youth sides, Coric earned a well-deserved call up for the senior national team earlier this year and was part of the squad that traveled to France for the European Championship. Analysis: Before delving into the more technical side of things, the foremost thing that needs to be mentioned when talking about Coric is that he is absolutely a joy to watch when he is playing. He can dribble, he can accelerate, he can fake passes. He is sublime when in possession. As per FourFourTwo, Coric became the first one in Bayern Munich’s history to fully complete all the tasks at their youth camp, and score the maximum number of points in their grading system. It is no wonder the German giants were desperate to land him. His touch on the ball is magnificent, but importantly, he doesn’t keep the ball for too long just because he is good with it. He is a proper number 10 and possesses great vision to knit a crucial pass. He is an attacking midfielder, but has often been used in a deeper role. Because of his in-game intelligence and ability to spot the right pass, he has shown that he can orchestrate things from the heart of the pitch as well. He isn’t very aggressive on the pitch, and his defensive contribution is lacking somewhat. He should ideally also be scoring more goals. But these are all weaknesses that can be removed by working exclusively on them and as a player gains more exposure and experience. What is more concerning and could perhaps be ticked under this box of “weaknesses” is temperament. When media outlets started talking about his partying habits and unhealthy lifestyle, Coric attacked the club, criticised president Zdravko Mamic and his brother and head coach Zoran Mamic. He was warned for his actions. This is the only notable shortcoming of Coric. He is 19 and it is normal for a teenager to lose his temper, but he needs to be more professional on as well as off the pitch and handle things better as similar instances have cost youngsters with a lot of potential, a bright future. Looking Ahead: His contract with Dinamo Zagreb is until 2020 and it’s highly unlikely that he will see that out but Coric is highly aware of his abilities and how good he is. The list of clubs trying to secure his services is getting longer by the minute. It remains to be seen how long these suitors can’t offer him something he can refuse because Coric is good enough to feature for most clubs in Europe. Blurb: Midfielders are expected to do almost everything these days. They are expected to be workhorses, creative passers and what not. Mahmoud Dahoud falls into the rare category of players who are capable of running forever and also be an excellent distributor of the ball from the center of the park. Dahoud was born in a small town in Syria before his parents moved to Germany. He is the first ever Syrian born player to play in the Bundesliga. Dahoud began his youth career at Germania Reusrath and later played at Fortuna Dusseldorf before moving to Monchengladbach in 2010. Having been handed his first team debut by the then manager Lucien Favre in a Europa League tie, Dahoud was nurtured carefully by Favre and exposed to first team appearances selectively. Upon Favre’s resignation, Andre Schubert had thrown Dahoud into the mix directly and things have been on the up constantly for the supremely gifted midfielder. 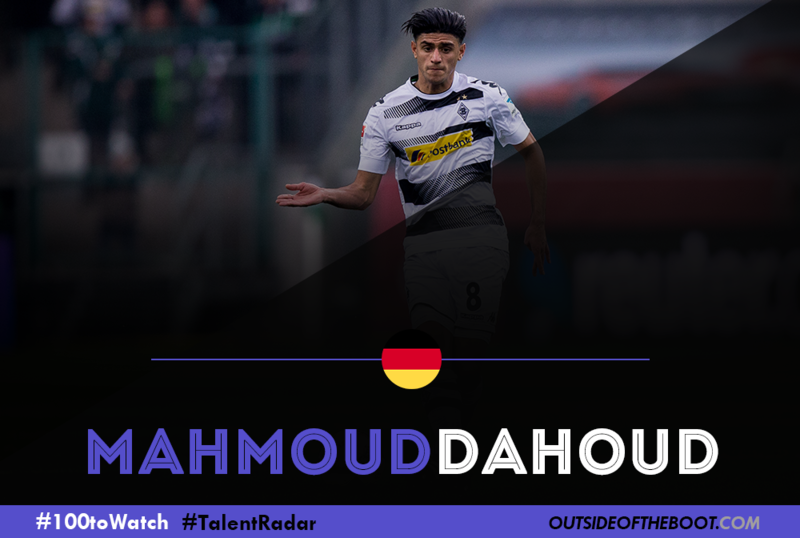 Analysis: Dahoud is known to cover almost thirteen kilometres a game and is seen on both ends of the pitch; this amazing work rate of his has made him a regular fodder for Bundesliga enthuasiats. He is an excellent dribbler of the ball and has great ball control in tight situations. He is more than capable in possession and works like a horse when without it. Dahoud is a good tackler of the ball and also has the uncanny ability of reading the game well in advance. It helps to have a passer like Dahoud in the team who is good at playing the short passing game and also capable of switching play with a long ball. In addition to all this, Dahoud is blessed with good technique and can shoot the ball well from distance. With the great engine he has and the qualities he possesses he is as good a box to box midfielder one can find today in any club. The most commendable attribute he has is that he has really high levels of concentration and has a very calm head. Composure is vital when a player plays as a midfielder and Dahoud possesses this in abundance. Dahoud is press resistant and his slender frame gives him great balance to manoeuvre his way through in congested areas. His passing is top quality and knows when and where to release play. Despite all this, Dahoud is still far from the finished article. He dribbles too close to his box at times and when he loses possession, leads to turnovers in very dangerous areas. Gladbach have conceded goals because of this and it is something he has to get rid of in his game. Looking Ahead: Dahoud is just 20 years old and already boasts regular first team exposure. He is definitely going to keep improving before the top clubs hound for his signature. Despite being born in Syria, Dahoud is eligible to play for Germany having already represented them in the youth level. Despite not featuring in the Euros this year, Dahoud can and will probably feature for Germany in the 2018 World Cup if he keeps going at this rate. 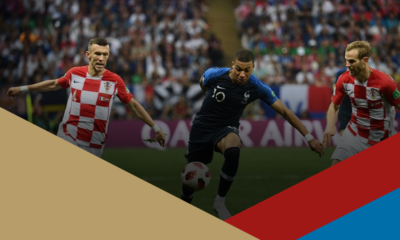 Blurb: It’s no secret that French football is enjoying one of it’s most fruitful spells in terms of developing products, with the current national team and the potential future one looking as bright as ever. While plenty of youngsters get their opportunities at first team football in Ligue 1, the abundance of talent makes it difficult to stand out. But those brave enough to venture abroad, usually create a bigger stake for themselves in the French football prize. The likes of Antoine Griezmann, Paul Pogba and Kingsley Coman are prime examples for individuals from the European nation, who ventured away from their homeland for success. Young Ousmane Dembele is another one who took that step rather early in his career, though having developed in France before his well deserved move to Borussia Dortmund. Analysis: The teenager burst onto the scene in the latter part of the 2015-16 season with Rennes, having started the season with short cameos before quickly establishing himself in the first team. It was in the early part of 2016 that he got his big break, with regular ninety minutes a reward for his displays. 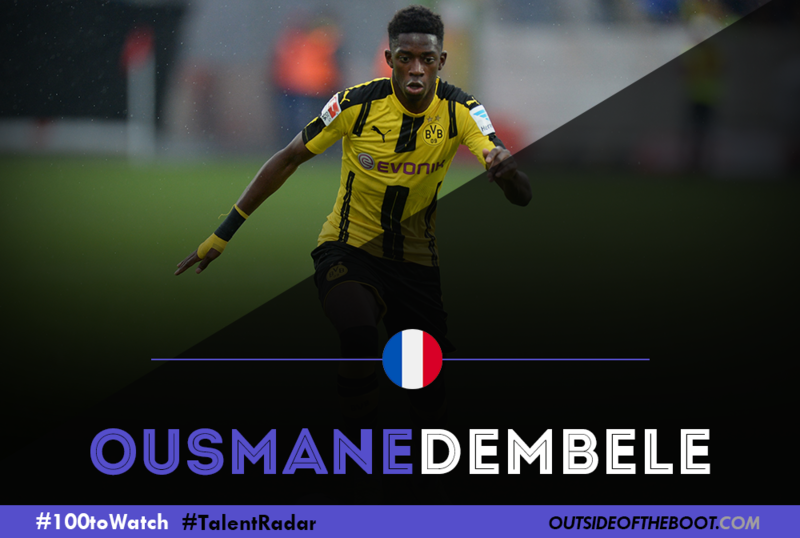 Quick with his feet both in terms of raw pace and control of the ball, Dembele quickly stood out in the top tier of French football. With excellent close control to ensure maximum retention of possession while carving out attacking opportunities from difficult situations, Dembele developed well in a fast paced game. His ability to shoot with either foot furthered his stake on first team duties, as many began to notice that Dembele wasn’t just another youngster given too many opportunities too soon with the potential to break down early in his career. But rather, Dembele oozed confidence with every game and his every attacking opportunity to convince enthusiasts of his true ability. His move to Dortmund and the Bundesliga, a league where fast paced counter attacking football suited Dembele well only helped further in developing his football knowledge. Though the Frenchman was faced with a new type of football wherein sides began respecting Dortmund’s superior ability more often than a side would respect Rennes’, resulting a slightly more defensive approach and a new difficulty for Dembele to play through. But the 19-year-old has done well when deployed on either flank, being trusted by Thomas Tuchel in his fluid attacking approach and fast flowing midfield. With the likes of Aubmameyang, Gotze, Kagawa and Schurrle around him, Dembele has felt at home with the footballing methodology, and more often than not has kept out his more direct (and experienced) competitors from the side with Tuchel justifiably rewarding the youngster. Looking Ahead: Competition for places is immense at Dortmund, specifically in the position currently occupied by Ousmane. But while Dembele has risen to fame quickly, 2017 might be a more crucial year than any of the preceding/succeeding one. Dembele would have expected to be competing at a title-challenging/dominating side, but Dortmund have struggled to keep pace at the top. To perform beyond expectations at a side like this becomes difficult, given the margin for error is far less than what Dortmund faithful would have hoped. But 2017 will set precedent to a World Cup year, and Dembele knows he needs to work hard enough to be at Russia in 2018. Blurb: The journey from obscurity to relevance is usually a long and arduous one but when you’ve already played in two divisions and three clubs in Italy, relevance becomes no more than just a word. Just over two years ago, Amadou was playing for a local church team in his native Guinea before making a move to European football. Analysis: Last season, the 19- year old featured thirty-fice times for Roberto Donadoni’s Bologna side and showed why he is considered one of the finest young defensive midfielders in Europe’s top five leagues. 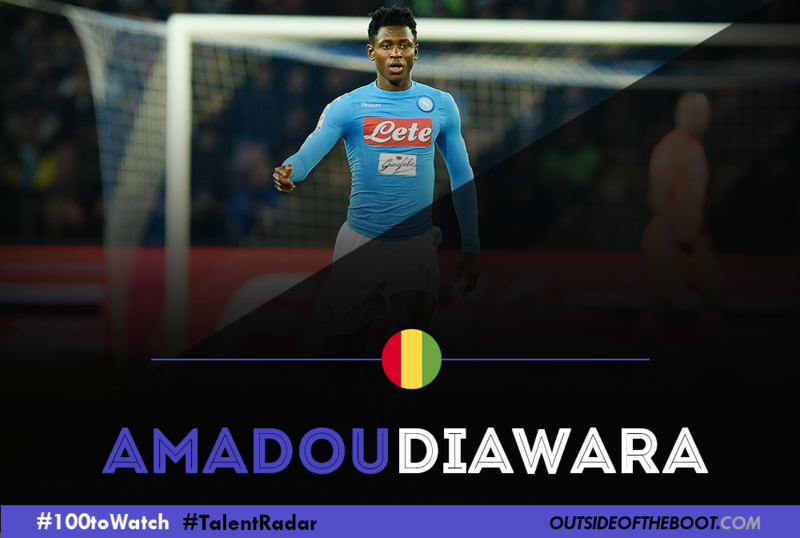 Strong on and off the ball, great in the tackle and a menace in the air, Diawara is no pushover. He embodies the ‘destroyer’ role but not all brawn, there’s brain too as evidenced by his 91% pass accuracy this season at Napoli. Last season he averaged 2.2 tackles and 2.7 interceptions per game. Indeed his 1626 passes attempted meant he was the youngest player to attempt 1000+ passes in Europe’s top five leagues last season and he averaged 47.9 passes per game. His aerial prowess and ability to take on the opposition are equally impressive. Perhaps it’s his shooting that can be viewed as the only real down side to his game. He failed to score last term and only 8% of his attempts were on target but when your job is primarily to shield the back four we can’t really complain, can we? Looking Ahead: He secured a move to Italian giants, Napoli in the summer, and though he has struggled to secure a regular starting berth in Maurizio Sarri’s side, with time he can work his way up the pecking order. Blurb: Born in Dakar, Senegal, Assane Diouuse moved to Italy aged 13 with his father. He was inclined towards football and soon joined Empoli’s youth academy. He developed into a very good footballer and soon made his debut in 2015 for the Serie A side. He has gone on to become a first team regular this season. He made a solid partnership with Piotr Zielinski who thrived when Diousse played alongside him. Zielinski has moved on while Diousse is becoming an integral part of the Empoli set up. Analysis: A defensive midfielder with emphasis on breaking play rather than creating the play, Diousse is a natural pivote. He is a great passer of the ball and has a pass completion rate of 86.8% this season. He drives the team forward with his work both on and off the ball and breaks up play well. He is an out and out team player and puts in an admirable shift each game. His intelligence in reading the game is also evident from his decision making and intercepting the ball. His best role would be being the defensive midfielder in front of the defense as a lone pivot, which is how he is being utilised now. However it must be said Diousse possesses the qualities to play further up in central midfield. His strength makes him a formidable defensive midfielder and he can put in the hard tackles. 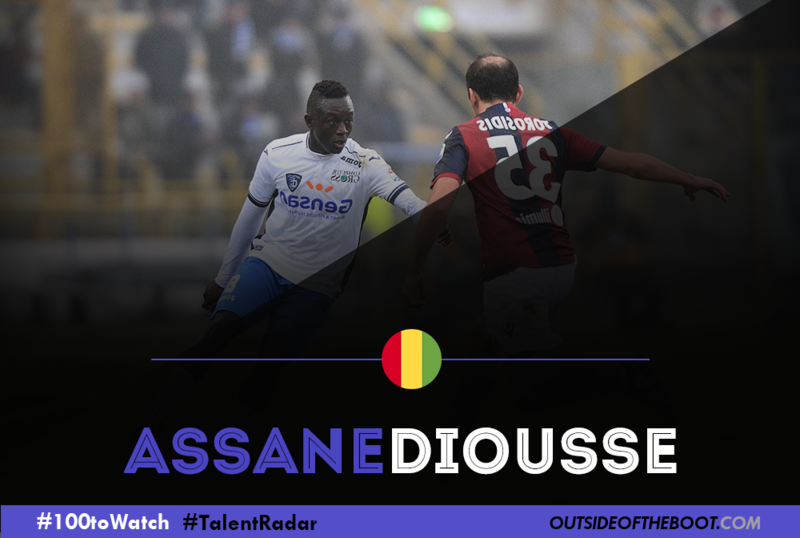 Diousse is excellent in combination play and likes to dictate his team’s tempo. Though he prefers a short passing game, he is capable of switching play. He is a rare breed as he is physically strong and can put in the tackles while also possessing very good vision and passing. His tactical intelligence is high even in this young age and has the knack of knowing when to stay put in his zone so that he can always be available for receiving the ball and link up play. Diousse is nowhere near as good in air as his other qualities. His aerial prowess is sure to be improved while he can also improve on his technique while shooting. Looking Ahead: Diousse himself has stated that he dreams of playing for an elite club with Barcelona and Inter Milan being his favourite clubs. Despite not performing as well as they did under Mauro Sarri, Empoli can prove to be a great platform for Diousse where he can mould his talents and grow up to his potential. It is all about keeping his feet on the ground for the Senegalese lad, who is yet to earn a cap for his national side, but will soon do so as he seems to be blossoming into a great prospect. 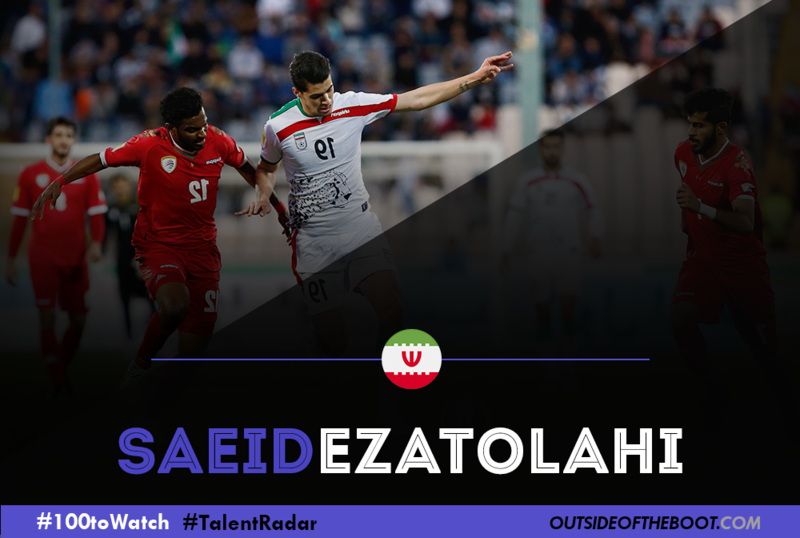 Blurb: Iran’s youngest-ever goal-scorer, as well as the youngest player to play in his country’s top flight, Eztolahi’s trip to Rostov came via Atletico Madrid, where he failed to make an impression amongst a cadre of similarly skilled prospects. He is not yet a first team regular for Rostov, but his performances this season have more than shown enough to warrant his inclusion in this list. Analysis: Tall and lanky at 6 foot 3 inches, Eztolahi has been played most often as an attacking midfielder in manager Ivan Daniliants’ 3-5-2. The system sees the southern club seek to play a wildly aggressive counter-attacking style, and his use of Eztolahi, while still developing sees the youngster not as a target man, or an orthodox no 10, but as more of a central midfielder. His effectiveness comes not only via his range of passing, (balls over the top to his pacy countryman, Sardar Azmoun are a favorite) but also through his tackling. Rostov’s has been poor, the club having received seven red cards this season, but Eztolahi has generally kept himself out of the referee’s notebook, having received just two bookings in the league at the time of writing. His pace and anticipation are his best assets, though, his long legs and well-developed positional sense allow him to effectively launch counterattacks, either by running directly at opponents or through his passing, which is already sublime. Strong and wiry, his control could be a bit better, but as his talent has developed, he is still adapting to a more advanced role and should be given a pass in this regard. More could be asked of his strength, especially given his size, but again, there is plenty of time for that to be improved upon as well; the future is generally bright. Looking Ahead: Just 20 in October, and with Rostov still involved in the Europa League, there is still more to come this season from Eztaolahi. Last season had been curtailed due to visa issues; he didn’t feature at all for the club after arriving in January. However, as fellow midfielders Christian Noboa and Aleksandru Gatcan both in their early thirties, there will undoubtedly be more opportunities as the club seek to maintain their defensive solidity whilst seeking a bit more in attack. There have been impressive displays, such as putting three past Bayern Munich and scoring four against Ajax, but in the league, improvement is needed, and much of that will come through the youngster’s creativity and directness. His performances against Anderlecht in the Champions’ League Qualifying have hinted at more goals, and the more he can link play with a long pass, the more his burgeoning reputation will grow. His short passing could use a bit of growth, but he has shown flashes of ability in this regard with Iran; his role with Rostov doesn’t exactly lend itself to much intricacy. Finally, for as talented as he is on the ball, his willingness to link play could use some improvement, as he is liable to get into dangerous positions but often fails to find an open teammate. Blurb: Times are tough for defending Russian champions CSKA Moscow, after seventeen games out of thirty in this season’s Russian Premier League, the 2015-16 champions are eight points behind Spartak Moscow, have little chance of retaining their title and just prior to their defeat to Tottenham Hotspur at Wembley in the UEFA Champions League, long-serving coach Leonid Slutsky resigned as manager. CSKA need a rebuild at the moment, however, for whoever does succeed Slutskiy, Alexsandr Golovin is a precious tool to conduct such a rebuild. Analysis: Golovin exploded onto the scene in the second half of last season, breaking into CSKA’s starting line-up in a box-to-box midfield role. As 2016-17 began, Golovin maintained his place in the starting line-up, with Slutsky trying him in a wide midfield role in CSKA’s Russian Super Cup loss to Zenit in addition to the box-to-box role that he occupied last season. However, just like last season, a significant event was about to occur which would further accelerate Golovin’s standing. CSKA’s chief playmaker, Roman Eremenko was given a 30 day suspension from football activities, which later became a two year ban from football after a positive test for cocaine. With Eremenko banned, Golovin was instantly promoted to the role as CSKA’s playmaker, occupying the central playmaker’s role in the attacking midfield three of Slutskiy’s 4-2-3-1 formation. The main creative role at a club is a huge responsibility, especially for a 20 year old youngster who only became a first team regular at the club at the latter end of last season, however, Golovin has got the talent to make replacing Eremenko a seamless transition. His strengths include a good first touch, good dribbling, a wide range of passing, which all midfield playmakers need and finally, good movement when dribbling with the ball to pull midfielders assigned to mark him out of position thus creating more space on the pitch for attacking moves. 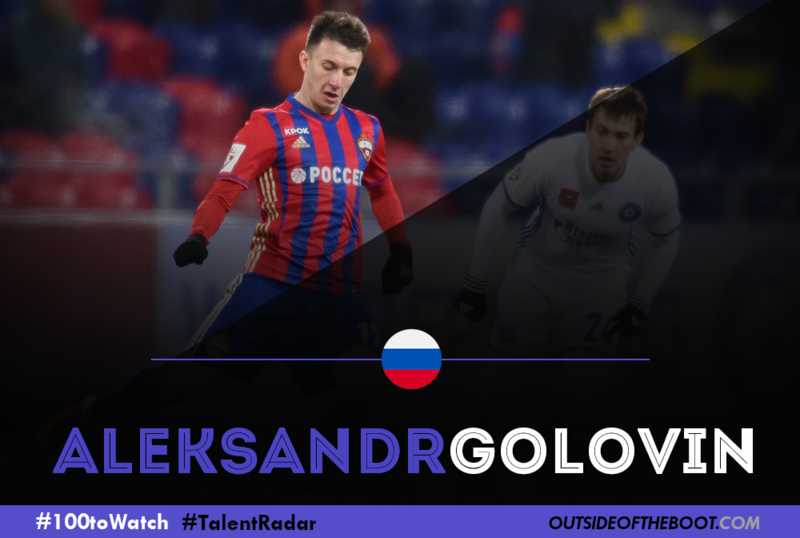 Looking Ahead: Prior to replacing Eremenko, Golovin was moved around a lot with his position, sometimes used as a box-to-box midfielder in a midfield two of the 4-2-3-1 formation, sometimes used as a deep-lying playmaker, sometimes as a wide midfielder. Ever since Eremenko was firstly suspended and then banned, Golovin finally now has a stable position after several months of being moved around, which should help him further develop and improve. To have already been given the responsibility of main midfield creator at such a young age is a sign of just how highly CSKA value him. Targets for Golovin over the next eighteen months should include firstly becoming the best player at CSKA, becoming one of the best players in the Russian Premier League before finally becoming a key player for his country in the 2017 Confederations Cup and in the 2018 World Cup which Russia is hosting. 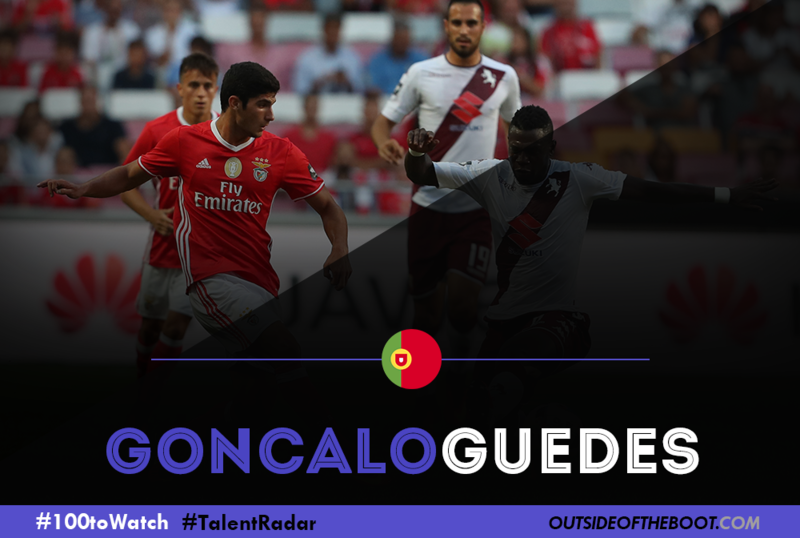 Blurb: When Gonçalo Guedes, an unknown 18-year old, made his debut for Benfica’s senior team, his coach Jorge Jesus said he had a player two years ahead of his age. Two years later, he has undoubtedly shown all of his maturity, reaching a regular spot at Benfica (he won the Portuguese championship every season he has played there) and at the U21 Portuguese side, while also having played two matches for Portugal’s senior team. Football fans are witnessing the growth of a versatile and promising talent who has already become a fan favourite at his life-long club. Analysis: Gonçalo Guedes is a winger. Nonetheless he possesses a rather different style of play than most players in his position. Playing preferably in the right side of the pitch he does not stand out for constant dribbles or an almost selfish way of creating danger. Instead, his main attribute is his physical power, both in pace and composure. He never gives up on any play, therefore posing quite enduring threats to any defender. His fierceness and competitiveness add to his natural physical qualities, further enhancing them. Another manifestation of Guedes’ power is definitely his finishing skills. Possessing a strong shot, he adds fire power to any side is playing for, registering fair numbers throughout his career so far. Furthermore, Guedes demonstrates incredible pass accuracy, being able to apply it in the last third of the field by making numerous assists. 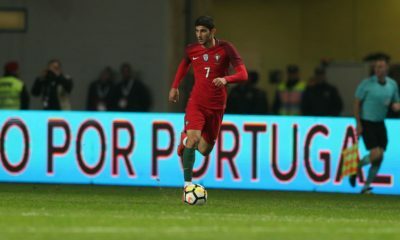 Although, as previously said, Guedes is a winger, his style of play enables him to adjust easily to the role of a forward, in support of the main striker or as a false nine. While in these functions, he is tailed for a freer role on the field, disrupting almost any strategy the opposite side has planned defensively. In fact, he has performed such duties this season for Benfica and his impact is noted not only on the goals scored but on the multitude of chances he helps creating. Looking Ahead: Although another season at his home club could certainly benefit him as he recently signed a long term contract until 2021, it remains to be seen if Benfica can hold on to another prized possession. His capability to be decisive in a match might delay his full ascension, but if he continues displaying his quality at a regular rate, there’s no doubt we’ll be talking about this Portuguese talent for years to come.